Our Lady of the Abandoned Parish is located at Sta. Elena, Marikina City. This was where my husband and I received the sacrament of matrimony as officiated by Fr. Gerry Evarola. 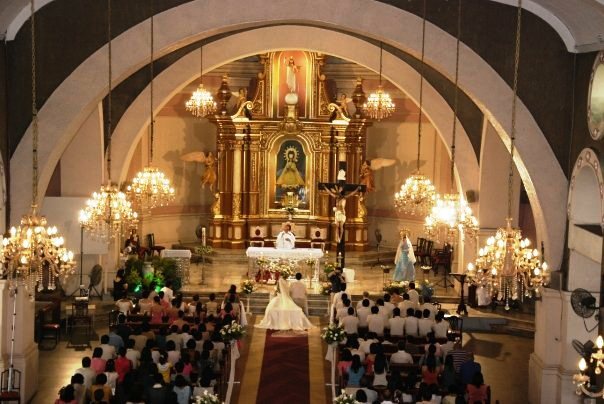 Many memories and firsts of my childhood years were celebrated in the four corners of this church since I was a gradeschool student of Marikina Catholic School, that’s why I was very grateful that my husband and his family agreed to have our wedding here. Of course, I wanted my wedding to take place in the church which has significance to us or either to one of us. And, with God’s grace everything fell into place and my simple wish was granted. Recently, I went to OLA Parish requesting for my daughter’s baptismal certificate. Yes, we had her baptized there as well. And just in time, I also asked for their copy of wedding requirements so that I can share it with my readers. To all those who are planning their wedding, I hope this blog post will be of great help in your preparations. ***Wedding Tip: Book your wedding in advance. If possible at least 6-12 months before your preferred date so you can choose the schedule that you want. ***Wedding fee is not inclusive of flowers and carpet. Since the church was renovated and the flooring was changed, they no longer allow the use of carpet. Photo was taken last May 2009. Major improvements were already made at the facade and inside of OLA Parish. I’ll post an updated photo as soon as I visit again. Hi Sis! I have question about sa marriage contract. Sa OLA din kami kinasal pero di pa namin nakuha yung marriage contract namin, mag 2months na. Sa munisipyo ba kukunin or sa church na mismo? nabusy kasi kami sa work. Thanks for answering, nababother na kasi ako. Di ko mapuntahan yung church agad kasi medyo malayo bahay namin. Hi! It’s best if you’ll go to OLA Parish. We got ours there. Hi what is the main reason why the church does not allow red carpet on wedding ceremony except for the answer of “It’s the rule”? We reserved the date for coming June 2017 but I’m dissatisfied without it and their reasoning is hard to accept.